The first church in the township of Coweta was the Methodist church. Built in 1890 in Choska Bottoms, a 25 x 40 foot building was later moved to Division Street in Coweta. The building was moved again to where Central Elementary School is now. Rev. Francis C. Maberry was the first minister to serve the church and Mrs. E. Watson was the first Sunday School Superintendent. In 1904 the church had 25 regular members, and the members decided a larger place to worship was necessary. Before the building could be completed it was destroyed by a tornado and was reconstructed. Later a second tornado struck and tore off the belfry. This congregation until 1950 used this building. It was located two blocks west of Main Street. The organizers of this first Methodist Church were Mr. and Mrs. Connie Murphy, Sr., Mr. and Mrs. C.H. Frost, and Mr. and Mrs. E. Watson (grandparents of Lucile Trower and Ruth Byers). Some early day families active in the congregation were: Hoppings, P. A. Fox, Reeds, Ireons, Greens, Hammetts, Dodges, Pinsons, Millards, Major Vandevere, Floyds, Crocsants, Brewers, Gills, Cooks, Dobbins, Westmores, Secrests, Pahmeyers, Carters and Egans. houses while the church paid the rent. Mrs. Earl Wright and Mrs. Lotta Vernon Gibbons collected $2,000 to finance a new parsonage that was built on lots adjoining the old church. Rev. Hoole then became Coweta's first resident pastor. He established the first Grade B Sunday School in Oklahoma and received many accolades. Average attendance was around 150 and was the largest Sunday school in Coweta for 15 years. The Women's Society of Christian Service, previously known as the Ladies Home Missionary Society, was organized in 1944 with 43 charter members with Mrs. Frank Souse as its first president. Mrs. C. H. Gibbons was president for 12 years. The organization is known now as the United Methodist Women and maintains the church parsonage, as well as many other supportive and missionary projects. Church members had a vision for a new building on a new location and under the able leadership of Rev. Orville Parham that vision became a reality. In 1949 the lots were acquired and construction started on June 20, 1949. The present building was completed at a cost of well over $30,000. The old church was sold and the parsonage moved to the new church location. Rev. Parham conducted the first church service held in the new building on April 16, 1950. The golden anniversary of this congregation was celebrated on April 4, 1954 presided over by Rev. J.D. Price. Mr. and Mrs. Earl M. Wright were the only charter members present and were honored at this occasion. They had been active and loyal members for over 50 years. In 1959 the church voted to build a new parsonage of brick to match the brick on the church. The old parsonage was sold, moved and a new parsonage was completed in 1960. Rev. and Mrs. Russell Bracy were the first occupants. In September 1971, Marion Dunn, chairman of the board, challenged members to construct a new building to accommodate the education and recreational needs of a growing congregation. Rev. David Bates was the minister during construction. The building was completed in 1972 and the mortgage burned October 17, 1982, with Rev. Harry Dressendorfer serving as pastor. February 15, 1988 the church welcomed Rev. Jeannie Himes to be our first woman pastor. She served in that capacity for six and a half years, the longest of any pastor for this church. The Coweta church outreach ministries include a transportation ministry in conjunction with other Coweta churches to transport seniors in the community. Our food pantry continues to supply food for those in need and has done so for many years. Special food drives, individual member contributions, and the local UMW supply it. The church is also involved in the work with the Coweta community garden. 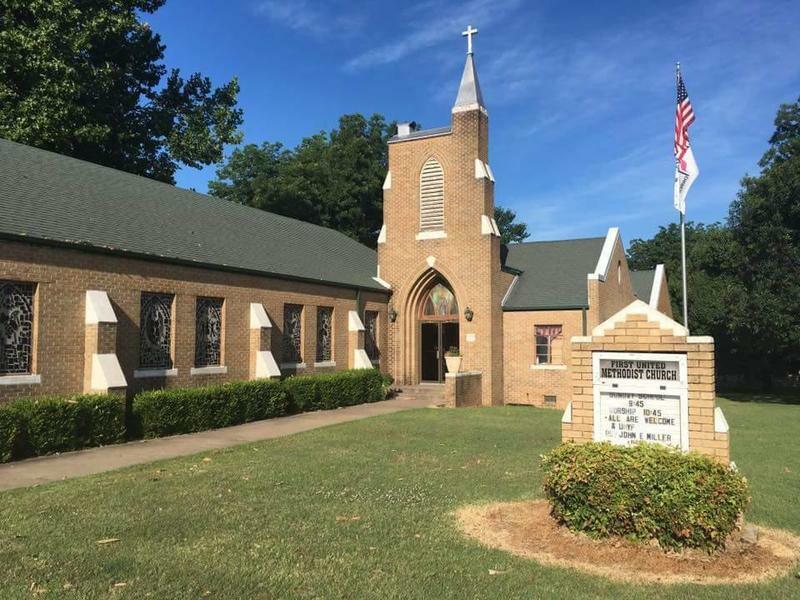 In November of 1988 Dollie Harrison, a long time devoted church member, went to be with the Lord and left a gift of over $200,000, her home place, and the contents of her house to the Coweta United Methodist church. The sale of the real estate and home contents came to over $46,000. This money was used to pay off the church parking lot debt, purchase a new van and buy two additional adjacent pieces of property. Her gift paved the way for the building of the church's current family life center. During the appointment of the Rev. Helen G. Taylor, the church made massive changes to their property. In June of 1998, new pews were dedicated in the sanctuary. Mrs. Bernice Collins was chairman of the committee, which completed this project. Easter of 2002 the sanctuary was remodeled by adding gorgeous stained glass windows. The two windows in the front of the sanctuary were accomplished by Mrs. Peggy Hughes, and funded by the whole congregation. Then individual members contributed the side windows or families in honor or in memory of loved ones. Lohman's in Tulsa were responsible for making the windows. The windows were symbolic of the stages of Christ's life. Mrs. Pat -Holder guided this project along with Rev. Taylor. In May of 2003 the church opened their new family life center. The church worked for many years to build the center and many individuals contributed time, service and money. George Stunkard was the chairman of the building committee when it was completed. The new family life center has enabled many ministries for the church including weight watchers, Sunday school and Wednesday night bible study, and the new preschool. Upon the retirement of Rev. Taylor, Rev. Allen Carson was appointed to Coweta in June of 2003. When school began in the fall, the church began a Wednesday night family program. With families gathering for dinner provided by Mrs. Margaret McDermitt, and then heading to Bible study for children, youth and adults. Also in the fall of 2003, the church responded to a call for help from neighbors of the church. With church members Eddie and Patti Plunk chairing the Vision Home project, Coweta built a new home for Dora McClure and Mary, Ricky, and William Walker. Demolition began on October 23, 2003, and the new home was dedicated December 23, 2003. Many contractors donated their time, and the entire community pulled together to see this amazing project completed. In the Spring of 2004, the church was given the opportunity to purchase a long-standing preschool in Coweta. God's Little Kingdom Preschool being relocated to First Methodist Church completed the long-term goal of owning a preschool and filling the family life center in a whole new way during the week. Fifty-five children ages 3 to 5 attend half a day of preschool Monday through Thursday. As we look back on the last 100 years of ministry here at First United Methodist Church of Coweta, we are encouraged as we anticipate our future and what God will continue to do among and through us. May we continue to be faithful to our mission of growing in God's love and serving others.